I awoke on Monday morning with a sinking feeling in my stomach. Looking out of the window I realised why. A blanket of snow covered the garden, shrubs trees, fences as far as the eye could see. It was 6.10 am and I had to be at work by 9 am. I groaned as I pulled on my three layers of stable clothing. Brrrr I thought, as the central heating hadn’t yet kicked in. Managing to get downstairs without being tripped up by Minnie or Maisie who chased down with me, hopeful for a handful of biscuits for breakfast, I filled the hens’ saucepan with water. After yet two more layers of clothing, a silly-looking wool hat with ear flaps and thick gloves, I ventured out of the back door. Brrrr, I said out aloud. Brrrrr, I said again, as I looked at the thermometer. -12 degrees it said. Brrrr flippin’ brrrr, I said again. The catch on the gate into the field was frozen, as was the bolt on the stable door and the clip on the gate into the hen’s run. Unable to touch metal anywhere with my bare hands, as they stuck to it, I kept my gloves on. After giving Max his breakfast I mucked him out. His droppings (poo to you) and the water in his bucket were frozen solid, as was the outside tap. 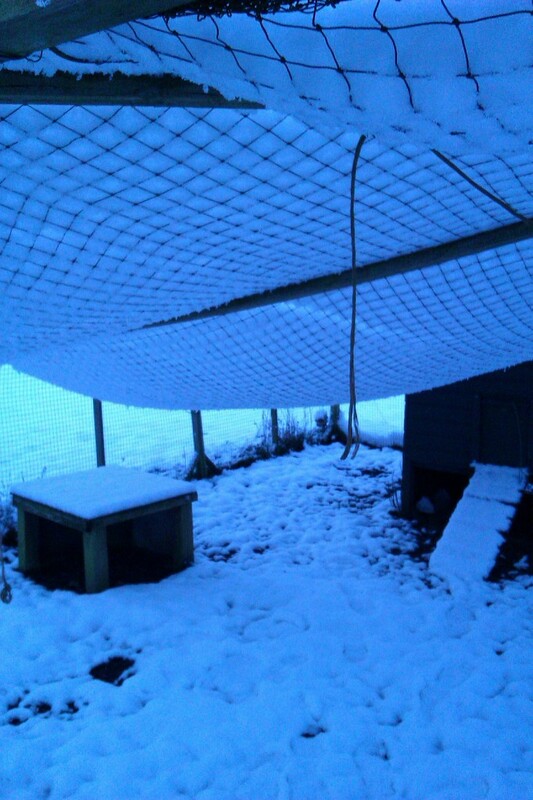 I groaned, (again) when I saw the accumulation of snow on the netting above the chicken run. Instead of 5′ high, the weight of the snow had reduced the height of the netting to more like 3′. 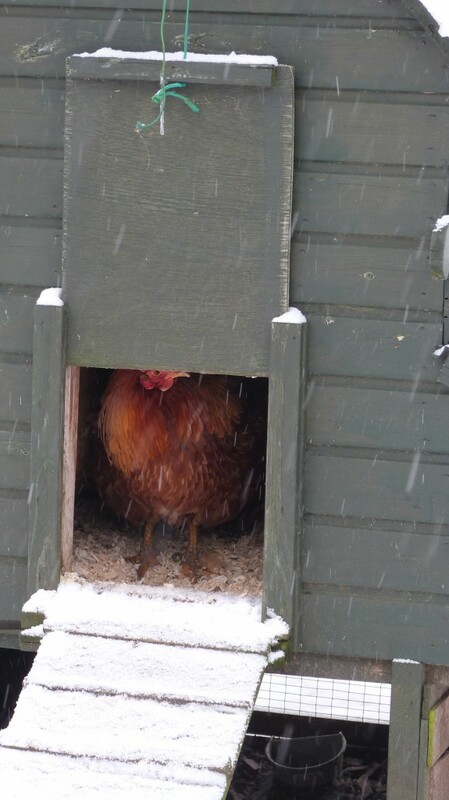 Before I could open up the hens’ pop hole, I would have to remove the snow weighing down the netting. This I did with a broom, from underneath. Thank god for my hat, I thought, as the snow showered down around me. I found some parcel tags (which were, surprisingly, where they were supposed to be) to anchor the netting that I’d pulled tight down the sides of the run. This done, I could open the pop hole. Oh well, stay in there I said, and they did – all day. Don’t blame them, at -12 degrees I didn’t want to stay outside either. Next job? Breaking the ice on the trough with a lump hammer and scooping it out with a sieve so it didn’t knit together. It was over an inch thick. Brrr, I thought. Had to fill Max’s water buckets in the bathroom and every time I went into the house my glasses steamed up. What a struggle, I thought as I trudged down the drive to open the gate. All of this before I try to get to work to start my day job! Finally, all the outside jobs done, I could go in to shower, breakfast, get dressed and off…. Oh, better get the snow off the car and turn on the ignition to warm it up, I thought. Easy peasey, right? But no, I couldn’t open the driver’s door! No matter how I tugged, it wouldn’t budge! So back into the house for some warm water and a sponge and yet again not being able to see because of my glasses steaming up. Blow this for a game of soldiers, I thought, as again I left the house with a another bucket of warm water. After a few minutes, I managed to thaw out the ice around the door and it opened. Allellujah, I said as I started the car. Crikey, it started first time! As I drove down the drive, a mere 40 minutes late for work, I looked in the mirror to see Max standing by the gate, looking at me …. Can I come in now please, mum? 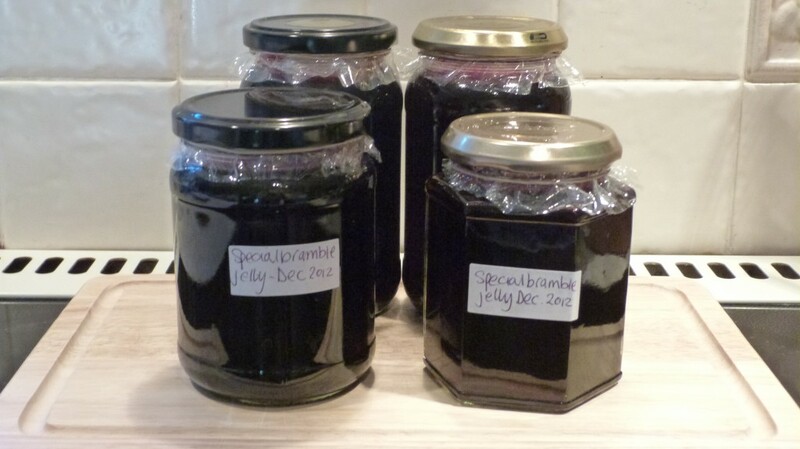 Needing to free up space in my geriatric chest freezer, in order to defrost it, I thought that the time was right to make some bramble jelly. 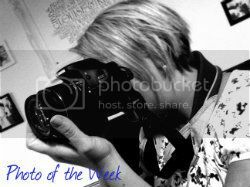 A one litre sized icecream container and three large yoghurt pots housed 3lbs of blackberries and 1 ½ lbs of blackcurrants. The former picked from the hedgerows around Mr M’s field and the latter my first year’s harvest from my one and only blackcurrant bush in my garden. Emptying the freezer has been a project of mine for the last 12 months or so. Every time I manage to run down the contents, I see some really good bargains in the supermarket that are going for knockdown prices. Not being one to miss a bargain, they come home with me to be slotted into the freezer space that had been liberated the week before.. and so it goes on. But I digress.. back to the jam making. The day dawned bright and cold – freezing in fact. 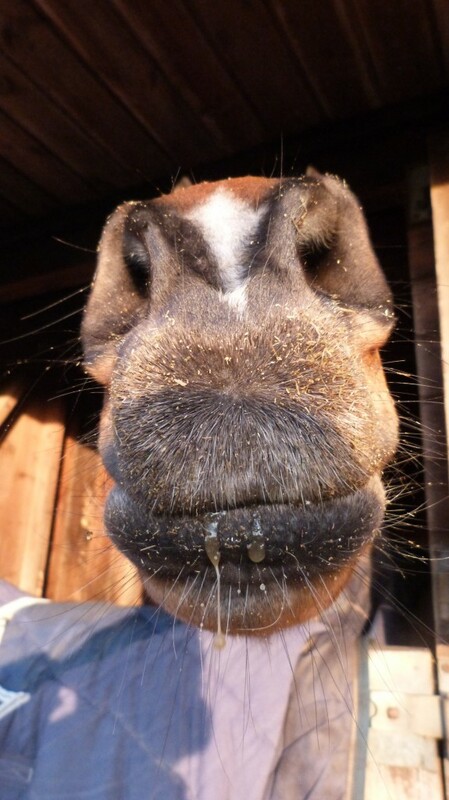 Before I could get cracking on the jelly, I had to feed and muck out Mr M and take him up to his meadow, a short walk up the side of a field at the bottom of the cottage paddock. As I walked him up there, admiring the first signs of winter on the frozen grass, I realised I hadn’t enough sugar… Blast, this would mean a dash to the supermarket. (I chose the supermarket over the village shop because that morning my electric toothbrush had given up the ghost, so I needed an urgent replacement). 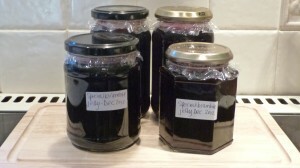 On my return, having spent a small fortune on lots of supermarket bargains, I was eager to ‘get preserving’. Easier said than done. The freezer lid was stuck fast, totally iced up! Finally after 15 mins chipping away I managed to lift the lid and delve into the icey depths to find the blackberries and blackcurrants. 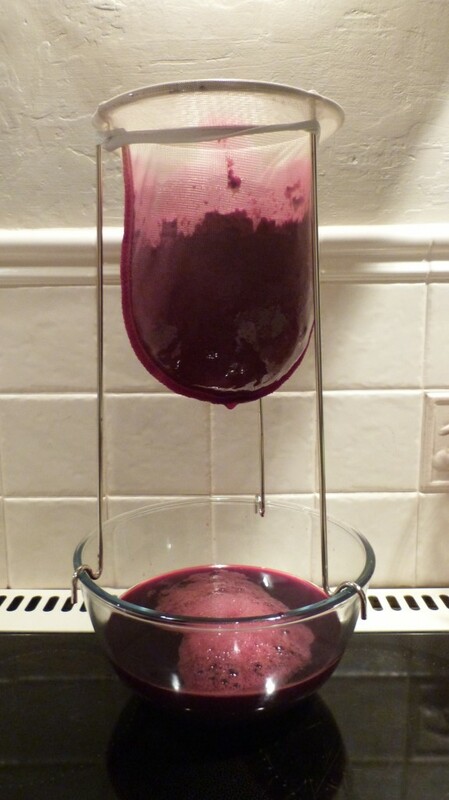 As I intended to include the blackcurrants, which contain much more pectin (the agent that helps the jelly set) than the blackberries, I decided to include just two lemons. Lemons are a good source of pectin for such fruits as blackberries and strawberries, that are low in pectin. Method: Put the fruit, lemon juice and chopped lemon shells into a large saucepan or preserving pan. Pour in the water and bring to the boil. Cover and simmer for approx 1½ hours, stirring occasionally until all the ingredients are reduced to a pulp. Add a little extra water, if necessary. Strain overnight through a jelly bag. This used to be the fun bit. Until I bought a proper holder for the bag, I used to lasso the beam over the kitchen sink and hang the bag from that, catching the liquid in a big bowl in the sink beneath. Only problem was, that you couldn’t use the sink until you had taken down the bag in the morning! Now I have the proper thing, life is much easier! Strain the cooked fruits overnight. Just let the pulp in the bag drip into the bowl. Don’t be tempted to squeeze the bag, as this will make the jelly cloudy. So, reaching this point I braved the elements to go and bring Mr M back from his field. I don’t know what had got into him, but he was an absolute maniac, with me hanging onto the end of his rope for dear life as he was bucking on the end of it. (Or doing handstands as a friend calls it!) With much difficulty, and with my heart in my mouth (as I am only 5.3″ and not big and strong, and not in my 20s any longer!) I managed to get him back into my home paddock. As soon as we turned away from the closed gate he leaped forward tugging the rope from my hands. Then followed a 10 minute exhibition of “Look how fast mum I can gallop around this little paddock. Can’t I buck high? !” I couldn’t watch, convinced that as he motorbiked around the corners, on the soaking ground, he would go down. Luck however, was on his side, and he managed to stay upright. 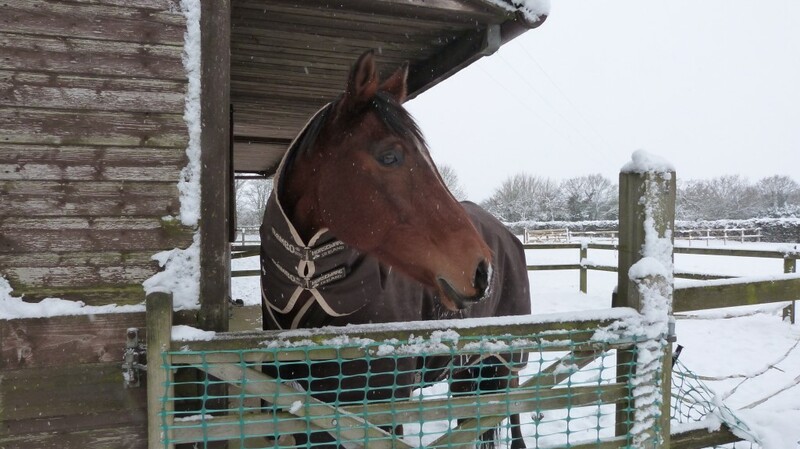 After 10 minutes, or more, he came to a halt, allowed me to pick up his sodden rope, which only minutes earlier had been wrapping itself around his galloping legs, and put him in his stable. Phew, I thought. For some strange reason I felt shattered when I went to bed, but not before the obligatory teeth clearning! Without thinking, I picked up the old electric toothbrush, turned it on, and… it leaped into life. Oh dear, there really wasn’t any need to go to the supermarket afterall ! Stir over a low heat until the sugar is dissolved. Then bring to the boil scooping off any scum that forms on the surface. Boil hard until it reaches setting point (104C to 105.5C). Well that’s all very well, but if you don’t have a jam thermometer how do you know when it reaches setting point? The trick is to put a blob of the liquid on a cold plate and when you pull a clean finger lightly across the top of it you will feel a skin forming if the liquid has reached setting point. If you are like me, you will usually have a little plate with about 7 or 8 little blobs on before you are happy that it has reached setting point. I now have a thermometer, which makes life so much easier, though the one I purchased was a little short for the depth of my preserving pan. So much so, that when it was hung on the side of the pan,the tip only was in the liquid, necessitating my holding it in the bubbling jelly which is rather hot on the hands! Looking at the liquid as it hit the required temperature I noticed that there were trillions of bubbles as it boiled, so this is a good indication of what it looks like when it is reaching setting point. Knowing this, you’ll probably get away with just a couple of blobs on your plate, not 7 or 8! About 10 mins before you are ready to pot up the jelly, put your clean jamjars in a warm oven to sterilize them. 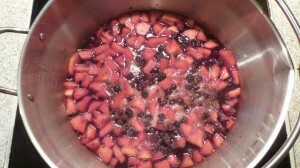 Once setting point has been reached turn off the heat and ladle the liquid into the heated jamjars. 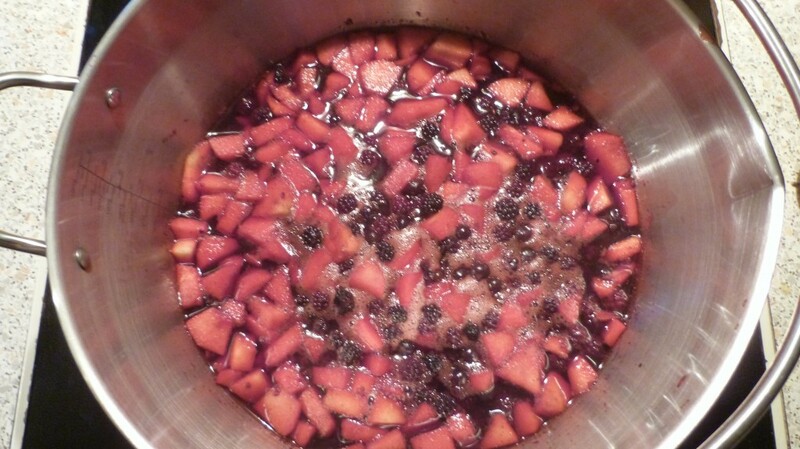 Using a jam or chutney funnel will certainly help direct it into the jar, otherwise lots can be lost on the counter top! Waxed discs are placed firmly on the top of the jelly (waxed side down), then a clear cellophane disc is held with an elastic band over the top of the jar. Dampen the disc with water before securing (ensuring that this is done will the preserve is still hot). The heat will dry the cellophane and tighten it across the top of the lid. Label up, including the date. Cut some material with pinking sheers and secure with another elastic band to make them look a little more special when giving to friends.